The Arctic’s sea ice extent reached an all-time low in September 2012, with the smallest recorded extent since satellite observations began. At 3.42 million square kilometres, it may still sound large, but this small extent of Arctic sea ice could have profound long-term consequences, and it follows a long trend of low sea ice conditions. Sea ice extent has been decreasing over the past 4-5 decades (Kinnard et al., 2011), and sea ice extent is now about 2 million square kilometres less than it was during the late twentieth century. Arctic sea ice extent has been falling for decades, and the larger amount of dark sea exposed each summer further exacerbates warming. A warmer ocean absorbs and the emits heat, resulting in further warming. This isn’t just about the polar bears – Arctic regions are predicted to warm the fastest globally over the next few years (Acia, 2005), which would result in further high-latitude melting of small glaciers and ice caps (Berthier 2010; Nuth et al., 2010; Gardner et al., 2011). It is these small glaciers that are expected to contribute the most to sea-level rise over the next few centuries (Meier et al., 2007). The Arctic Escalator. From SkepticalScience.com. NSIDC September Arctic sea ice extent (blue diamonds) with “recovery” years highlighted in red, vs. the long-term sea ice decline fit with a second order polynomial, also in red. Despite the overwhelming evidence to the contrary, many people, the self-proclaimed “skeptics” (see my post about this here) argue that sea-ice extent is constantly recovering. I like this animated graphic from SkepticalScience, which shows the difference between cherry-picking the ‘recovery’ years, and the generally accepted view, which looks at the long-term average. However, satellite observations are only valid for ~40 years; how do we know it hasn’t been this low before? Maybe we’re just seeing some form of natural variation in sea ice extent? Fortunately, we can use other means to record longer timescales of sea ice variability. “Proxies”, or indirect measurements using marine sediments, microorganisms, tree rings, ice cores or geochemical signatures, together provide a longer timescale of sea ice extent. Kinnard et al. 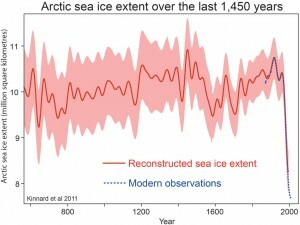 (2011) reconstructed Arctic sea ice extent over 1450 years using a combination of tree ring data, ice cores, marine sediment cores, lake sediments and documentary evidence, and found that the observed decreases over the last 50 years are indeed unusual, out of character and unprecedented. ACIA, 2005. Arctic Climate Impact Assessment. Cambridge University Press, 1046 pp. Berthier, E., Schiefer, E., Clarke, G.K.C., Menounos, B. and Remy, F., 2010. Contribution of Alaskan glaciers to sea-level rise derived from satellite imagery. Nature Geoscience, 3: 92-95. Gardner, A.S., Moholdt, G., Wouters, B., Wolken, G.J., Burgess, D.O., Sharp, M.J., Cogley, J.G., Braun, C. and Labine, C., 2011. Sharply increased mass loss from glaciers and ice caps in the Canadian Arctic Archipelago. Nature, 473 (7347): 357-360. Kinnard, C., Zdanowicz, C.M., Fisher, D.A., Isaksson, E., de Vernal, A. and Thompson, L.G., 2011. 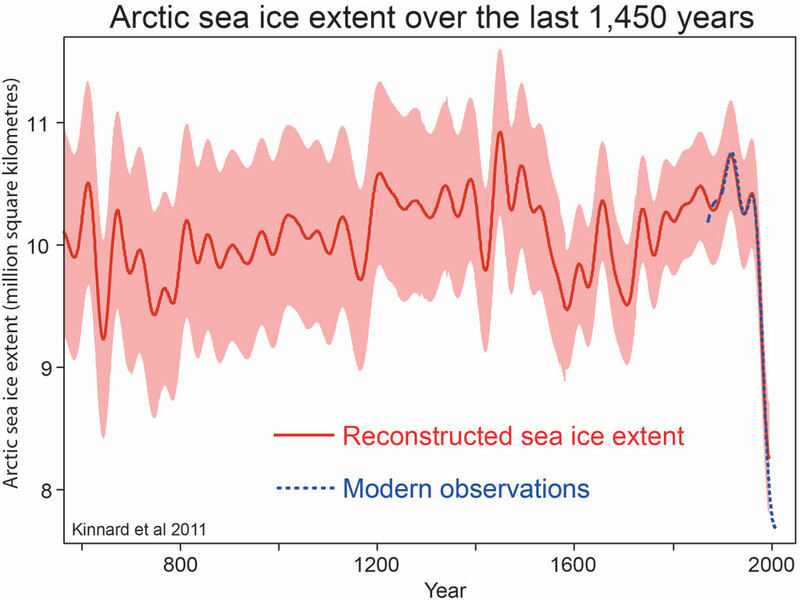 Reconstructed changes in Arctic sea ice over the past 1,450 years. Nature, 479 (7374): 509-512. Meier, M.F., Dyurgerov, M.B., Rick, U.K., O’Neel, S., Pfeffer, W.T., Anderson, R.S., Anderson, S.P. and Glazovsky, A.F., 2007. Glaciers Dominate Eustatic Sea-Level Rise in the 21st Century. Science, 317 (5841): 1064-1067. Nuth, C., Moholdt, G., Kohler, J., Hagen, J.O. and Kääb, A., 2010. 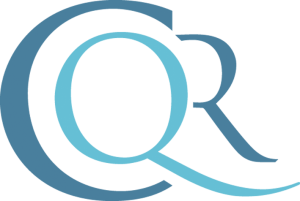 Svalbard glacier elevation changes and contribution to sea level rise. J. Geophys. Res., 115: F01008. This entry was posted in Climate Change, Sea level rise and tagged Climate change, Sea level rise by Bethan Davies. Bookmark the permalink.